Fame at last – sort of! 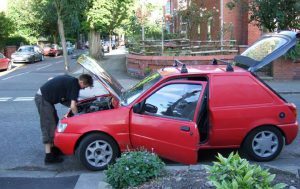 This was me and my well loved well used and unloved ratty old 1989 F reg Fiesta van, in about 2009. It spent some time as a header on the noskooljustcool website but also in a forum. At the time it really didn’t have many fans but was good cheap fun. Not many seemed to get the rarity of a very early mk3 van.